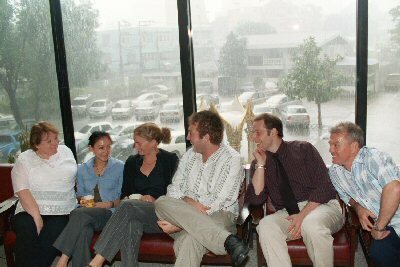 CELTA class in Bangkok, by Roger Bourke White Jr. I complained about this to Cambridge ESOL in UK and to my web site -- neither action changed the verdict. 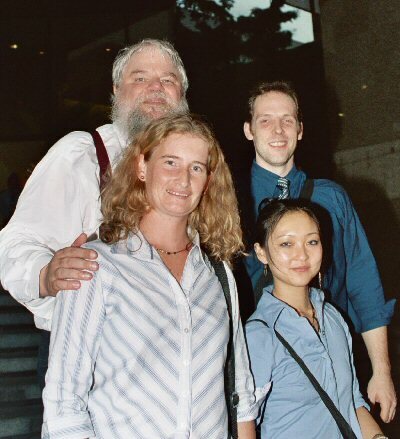 In November 2005 the opportunity came for me to retake the class, and I took it... this time with Elite Training in Bangkok, Thailand. You could always tell a rainy day at Elite. 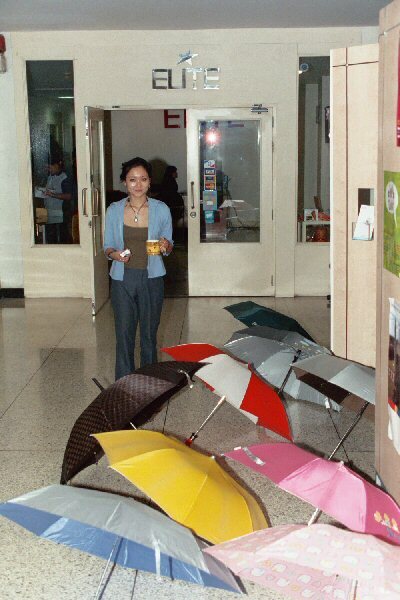 The umbrellas would pile up in the hall. Ruby is watching over them. Dom, Pete and Xander take a break. Griet, Ruby, Roger and Dom journey off to the British Council in the Siam Square area to watch some off-site teaching. There was a lot that was similar about the two programs, and much that was different. The similarities were the subject matter being covered and the way it was taught. The teaching method drove me batty again, but this time I'd learned enough that I adapted to it. This time I diagnosed the heart of the teaching problem: the CELTA teaching method is auditory-oriented -- it expects students to learn what they hear about. I'm a visual and kinetic learner -- information doesn't stick until I read it or try it out. As a result the most common CELTA teaching techniques are like listening to a screeching chalkboard to me. Griet Kenis -- from Belgium. She had an instinct to mime the English accent of whomever she was speaking with. When she spoke with Janice (one of our tutors) she would pick up a Scottish brogue. When she spoke with Albert, from England, the became UK English, and so on. She had a very direct style of teaching. Albert Pictureton -- from England. A very personable fellow, and a good communicator. He would set up elaborate teaching exercises, and pull them off well. Peter Duncan -- from West Australia. He's the first person I've met from Perth -- the city that's the furthest away from any other city. He was a serious person, but he could turn on comedy and be very entertaining. Jennifer Stampfel -- from Ohio. Jennifer got proficient at using various kinds of teaching aids. She even brought in her notebook PC and showed slide shows to the students from that. Ronald Jay Friedlander -- from Nebraska. Ron was the class clown. He developed a routine of imitating the UK mannerisms of the UK teachers in the group... with a generous helping of Monty Python mixed in. Roger White (me) -- from Utah. I got to be known as "Mr. Warm." I could get classes relaxed and talking. I even got beginner classes having discussions -- something beginner classes aren't supposed to be able to do. Those were the teachers in my half of the class. These others formed a second group that I never got to watch teach. Dominick Dumais -- from Minnesota. Ruby Kobayashi -- born in Japan but grew up in England. Alice A Palau Giovannetti -- from Milan, Italy. She learned some of her English in New York City, so when she was talking American, it came out with a mild Bronx accent. Xander Gubbens -- from Holland. Stuart Gale -- Now from Spain, originally from the southwest area of England (Devon). His "hometown accent" -- which he didn't use often -- is the closest accent in England to an American accent. They still pronounce "r"'s in the Devon area. 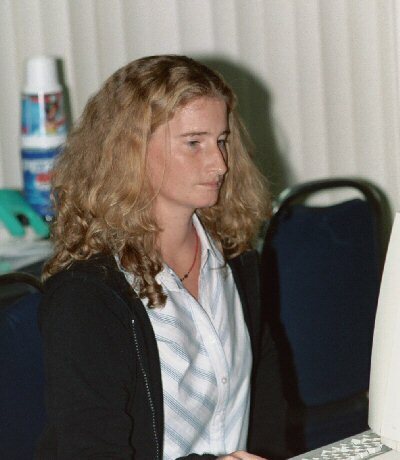 Janice Galloway -- Janice came from Scotland, near St. Andrews, the home of golf, and had spent time teaching in the Gulf States near Saudi Arabia. About half of each class day was spent preparing for the next class to be taught. It never seemed like enough time. Here Griet and Jennifer are hard at it. 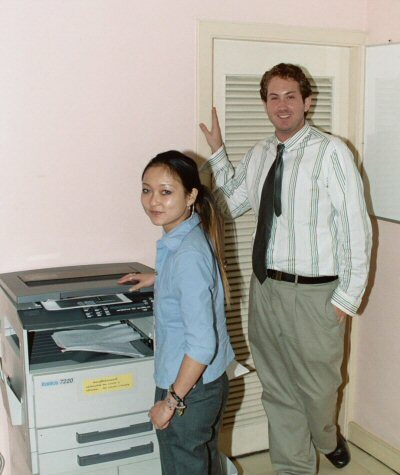 We were always making copies, so this was one of the centers of life at Elite, as Ruby and Albert are demonstrating. Another constant of the course was lesson planning. Alice is busy prepping up a lesson plan. Griet is getting something off the computer. She could be typing a lesson plan, pulling a picture down from a site on the Internet, or getting some printing done. Graham is making flashcards. 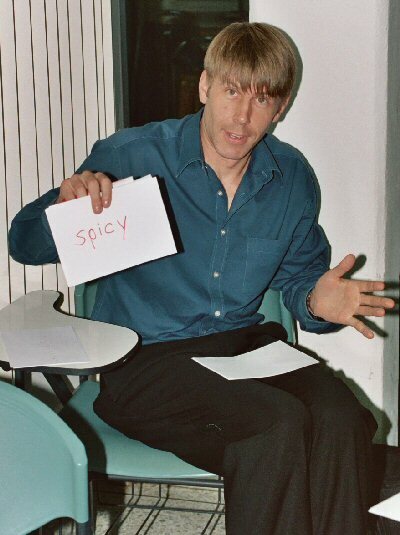 What is spicy we will have to wait for class to find out. Jennifer is getting ready for the class where she will put on a slide show with her computer. The student teachers spent a lot of time prepping for classes, and the student students came each day to attend those classes. Our students were all Thais. They were adults who came from local businesses. Some were good speakers and others were beginners. Some students waiting for class to begin. 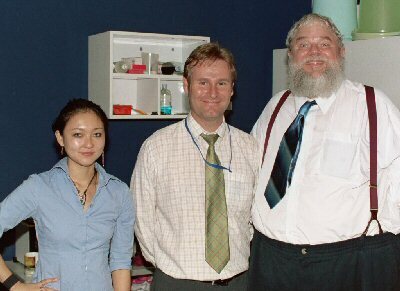 Beside them is Stuart, one of our tutors. Here he's sharing a strawberry smoothie with Pete, one of the teachers. In the end, I did OK. I consistently performed to standard, and there never was any crisis like there had been in Portland. 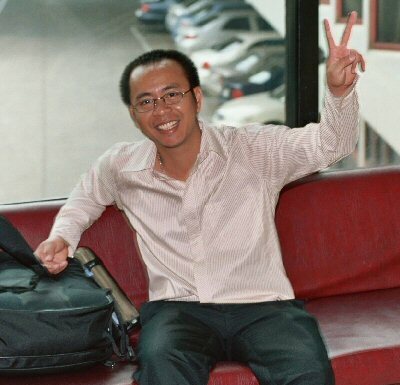 If I had gone to Bangkok the first time, would I have passed the class? ... it's hard to say, but I think so, because I didn't have to do a lot better to pass. What I am sure of is that the Thailand experience was a much better one than the Portland experience. I can recommend the International House, Portland experience... to fourth grade teachers I don't like. 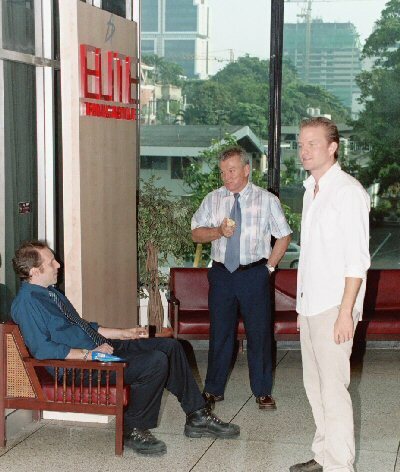 For the rest of the world, the Elite Training in Thailand experience was much better. 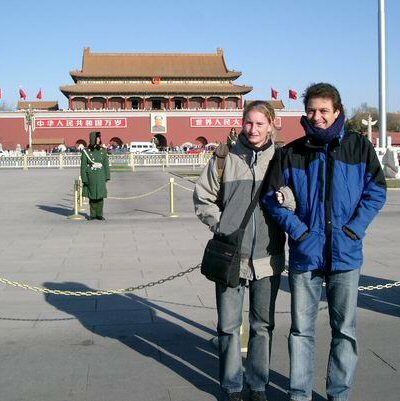 Shortly after class Griet went to Beijing with Thorsten... quite a change from a Bangkok November!